Although Steve and The Board were formed in Brisbane, Australia, in 1965, the story began 9,000 miles away in 1950. That was when Steve Kipner the founder of Steve and The Board was born in Cincinnati, Ohio. However, Steve Kipner didn’t spend much of his young life in Cincinnati. His father Nat Kipner, who was a songwriter and producer, who wanted a better life for his family, and started looking for a future beyond Ohio. Eventually, Nat Kipner decided that his family would move to Brisbane, in the state of Queensland. It was situated on Australia’s gold coast, which seemed the perfect place to start a new life, and bring up a young family. Fifteen years later, in 1965, Steve Kipner found himself studying at Brisbane Art and Technical College. By then, Steve Kipner had caught the music bug from his father who was now a songwriter, producer and promoter. Steve Kipner’s love of music began at an early age, and he had already penned She Used To Be Mine which featured on Normie Rowe’s debut album So Much Love From Normie Rowe. Already it looked as if Steve Kipner had a big future ahead of him after he left Brisbane Art and Technical College. However, it was at that venerable institution that Steve Kipner met two of his future band mates. This was drummer Colin Petersen and guitarist Carl Groszman. They were both students at Brisbane Art and Technical College and it was purely by chance that the three aspiring musicians met. Soon, the three students had formed a friendship and Carl Groszman was introducing Steve Kipner to new music, including bluesmen like Lightnin’ Hoplkins and Muddy Waters and the R&B of Ike and Tina Turner. All this was new to Steve Kipner, and he enjoyed discovering the new music. The third member of the trio Colin Petersen, had taken to picking Steve Kipner up in Mini Cooper and they would work out the harmonies to Beatles’ songs on the journey to and from college. On one of these journeys, they Steve Kipner and Colin Petersen came up with the idea of forming a band. 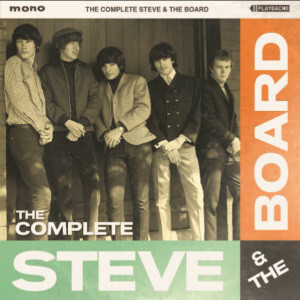 That band would become Steve and The Board, whose entire career has been documented on The Complete Steve and The Board. It will be released by Playback Records on ‘21st’ July 2017 and is a reminder of one Australia’s best garage rock bands of the sixties. Having made the decision to form a band, the three members of what later became Steve and The Board, began the search for a bassist. That was how they met Dennis Neville, who previously, had been the drummer for The Tempests. However, since leaving The Tempests, Dennis Neville had started to learn the guitar. When the three members of Steve and The Board met they Dennis Neville they managed to persuade him to learn to play the bass. Using a borrowed bass and amplifier, Dennis Neville taught himself to play the bass, and before long had mastered it. Dennis Neville became Steve and The Board’s bassist, and when they started to play live, drove the band’s van. Despite the band lineup still evolving, the nascent began playing the live scene around Brisbane. At first, they drew inspiration from The Beatles and British Invasion groups like The Hollies. Harmonies played an important part in the band’s nascent sound. That was until they met two musicians from Sydney. Terry Hanagan and Chris Grey, who had previously, been a member of the Missing Links had just arrived in Brisbane from Sydney when they first met Steve and The Board. The two Sydney-based musicians started telling the members of the band about City Blues, which was the urban take on R&B that the Rolling Stones had made their name playing. Having heard about City Blues, the band changed direction musically and even adopted a new name. By then, the band had still to adopt the name Steve and The Board. However, they weren’t far away, and renamed the band Board Of City Blues. Their set lists featured a mixture of R&B and songs by The Animals, The Yarbirds, the Rolling Stones, Them and The Pretty Things. Sometimes, they dipped into The Kinks, The Who and The Beatles’ back-catalogue during their sets. Board Of City Blues also started to include some of the songs that two members of the band had written. Despite Steve Kipner’s track record, he wasn’t one of the two songwriters in Board Of City Blues. That would come later. Instead, Colin Petersen and Carl Groszman, who had adopted the stage name Carl Keats, had started writing songs. Some of these songs would feature in Board Of City Blues’ set lists. This included the gigs the Board Of City Blues in a Nat Kipner’s club. Board Of City Blues were in the fortunate position that Steve Kipner’s father Nat owned a small club. He allowed the band to practise there, and to play live. This was perfect for the group to hone their sound. Having honed their sound, the Board Of City Blues were ready to make their tentative steps on the Brisbane live scene for the second time. However, this time they were a different band not just in name, but musically. One of the first gigs that the Board Of City Blues played was at a club called the Prim in the Piccadilly Arcade. After that, it looked as if the future was bright for the Board Of City Blues. That was until Nat Kipner sprung a surprise. He announced that the Kipner family were moving to Sydney, where he felt there were better business opportunities for him. A reluctant Steve Kipner made the move. With Steve Kipner moving to Sydney, it looked as if this spelt the end for the Board Of City Blues. That was until bassist Dennis Neville received a phone call from Steve Kipner asking him to bring the band to Sydney. Steve Kipner’s father had managed to get the Board Of City Blues some gigs, and there was even talk of a recording contract. This was too good an opportunity to turn down. The first to arrive in Sydney was Dennis Neville, who had resigned from his job the Monday. Given what he had sacrificed, Steve Kipner’s parents allowed Dennis Neville to move into the family home. Over the next two months, the rest of the Board Of City Blues arrived in Sydney. Carl Keats was last to arrived, and in the interim, a local guitarist had deputized for him. By the time the rest of Board Of City Blues had arrived in Sydney, they began the search for a lead guitarist. Auditions were held, and several guitarists tried out. This included ‘Long’ Tom Cowburn mentioned his friend Alex Hill. He had arrived with his family from Croatia, and as a child, studied classical violin. Eventually, he turned his back on classical music and the violin, and learnt to play the guitar. That was how Alex Hill found himself auditioning for the Board Of City Blues. It didn’t take long for the rest of the Board Of City Blues to realise that they had found their lead guitarist. At last, the Board Of City Blues’ lineup was complete, and they went in search of their first gig. The new lineup of the Board Of City Blues took place at a surf club in Wollongong. That night, the Board Of City Blues were well received by the audience, and this proved to be the start of something for the Board Of City Blues. Suddenly, the Board Of City Blues were playing nearly every night. Soon, the Board Of City Blues had more gigs that they could cope with. They were a hugely popular draw on the local scene. So much so, that some night, the Board Of City Blues played three gigs a night and sometimes, more. The move to Sydney had paid off for the Board Of City Blues. the Board Of City Blues had to audition with Maggie Makeig, the pop music editor at Everybody’s. Everything went well, but the record label weren’t sure of the band’s name. It was then that the Board Of City Blues became Steve and The Board. This was a much more acceptable and marketable name for the record label, and having signed on the dotted line, Everybody’s, sent Steve and The Board into the studio to record their debut single. The song that Steve and The Board had chosen, was a cover of The Pretty Things’ Rosalyn, with The Giggle-Eyed Goo! on the B-Side. This was a song that Nat Kipner had already written. However, Carl Keats made a few changes to the lyrics and wrote the music. Little did Steve and The Board know when they recorded The Giggle-Eyed Goo! in mid-1965 that it would launch their career. 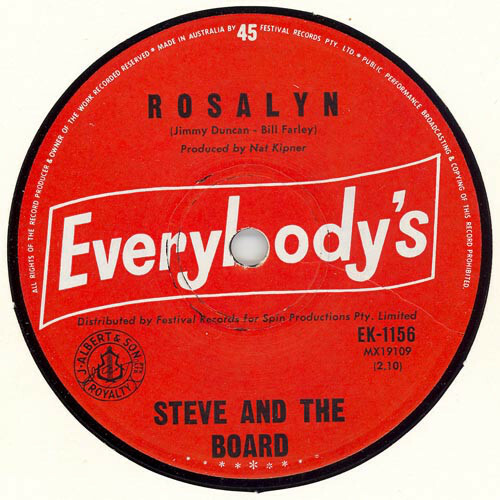 Steve and The Board released their debut single Rosalyn in October 1965. It found Steve and The Board stay true to The Pretty Things’ original version. Steve and The Board’s reading of Rosalyn showcased a talented young band. However, it wasn’t Rosalyn that caught the attention of the record buying public, and their children. Nat Kipner was able to secure Steve and The Board priceless publicity. He was involved with the children’s television show Saturday Date, and ran a competition that had children send in a drawing of what The Giggle-Eyed Goo! looked like. This was invaluable promotion, and propelled The Giggle-Eyed Goo! to number four in the Melbourne charts and thirty-four in the Brisbane charts. While the song gave Steve and The Board their first hit single, it proved to be a double-edged sword. While Steve and The Board received a lot of publicity due to the success of The Giggle-Eyed Goo!, it was regarded as a novelty song. The problem with novelty songs, was that very few people take them seriously. There was always the risk that promoters and other bands might not take Steve and The Board seriously. However, when Steve and The Board played live in Adelaide, it was like Beatlemania all over again. Having played two songs, Steve and The Board were mobbed by young girls. Nat Kipner’s novelty song had transformed Steve and The Board’s career. Soon, they were sharing the stage with some of the biggest names in Australian music. They also shared top billing with Herman’s Hermits. By them, Steve and The Board even had their own fan club. They had come a long way in a short time. Despite the success, Steve and The Board weren’t making any money. This wasn’t helped by a number of disreputable promoters refusing to pay Steve and The Board. As a result, they were left living a hand to mouth existence. Suddenly, the music business wasn’t such a glamorous way to make a living. By March 1966, plans were in place for Steve and The Board to release their sophomore single Margot, which featured I’ve Just Realised on the B-Side. While the single was given a catalogue number, it was never released. This changed when Steve and The Board released The Giggle-Eyed Goo! EP, which featured four tracks. They were The Giggle-Eyed Goo!, Rosalyn, Margot and Rosemarie, which were all produced by Nat Kipner. When The Giggle-Eyed Goo! 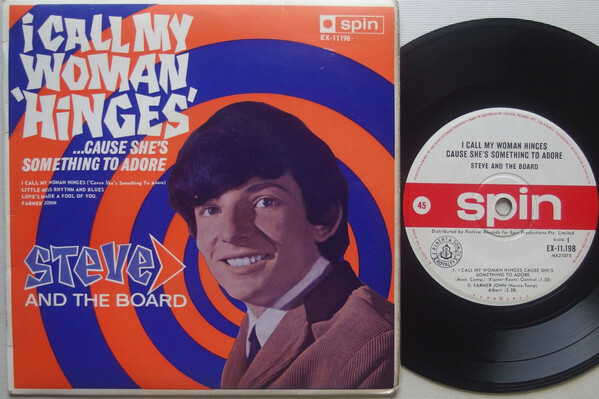 EP was released in 1965, Steve and The Board had been promoted to the main Spin label. With plenty of hype, The Giggle-Eyed Goo! EP was released on the record buying public. However, it never replicated the success of their debut single. Later, The Giggle-Eyed Goo! 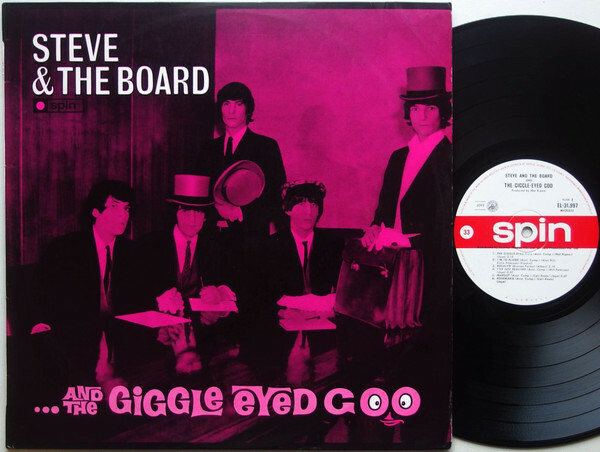 EP would featured on Steve and The Board’s debut album The Giggle-Eyed Goo! However, by then, the writing was on the wall for the band. That was still to come. A month after the aborted release of Margot, Steve and The Board decided to leave Sydney, as things were starting to cool down for the band. They packed their bags and headed to Melbourne, and soon, had secured a residency at the 10th Avenue Discotheque. It was run by Eddie Floyd, who soon, became the band’s manager. While Eddie Floyd ensured the band didn’t go hungry and secured them plenty of gigs, still Steve and The Board weren’t making much money. Each week, Steve and The Board played over forty-five hours, but only made £16 each. To make matters worse, Melbourne was notorious for promoters failing to pay bands, and Steve and The Board fell victim to this several times. It was a frustrating experience. Steve and The Board had some good times in Melbourne, and featured on ATV’s music show Go!! several times. This was invaluable publicity for the band. So was appearing on Kommotion, another popular music program that was presented by Ken Sparkes. Appearing on these shows would stand Steve and The Board in good stead when they released their next single. This was I Call My Woman Hinges (Cause She’s Something To Adore). On the B-Side was I Want. When the singles was released, it reached the top five in the Australian charts. It was a hook-laden, R&B stomper that caught the imagination of the record buying public. On the single, Steve and The Board sound like the Rolling Stones, and the hook sounds as if it has been inspired by It’s All Over Now. I Call My Woman Hinges (Cause She’s Something To Adore) was very different to The Giggle-Eyed Goo!, and showed Steve and The Board in their true colours. Not long after the release of I Call My Woman Hinges (Cause She’s Something To Adore), Steve and The Board released their sophomore EP in 1966. It was entitled I Call My Woman Hinges (Cause She’s Something To Adore), and also featured Farmer John, Little Miss Rhythm And Blues and Love’s Made A Fool Of You. Producing the new tracks was Nat Kipner, who had produced all of Steve and The Board’s releases. This would soon include their debut album. By the time executives at Spin started talking about Steve and The Board releasing their debut album, the band had nearly enough material for an album. They were sent into the studio to record three more tracks, including I’m To Blame, Love’s Made A Fool Of You and Lonely Winter which Carl Groszman had written. When these three new songs were added to songs from their two EPs and singles, Steve and The Board had more than enough for their debut album. Originally, Steve and The Board had considered the Board Meeting for album title. That would’ve been the perfect title for the album, given Steve and The Board were trying to establish a reputation as a serious R&B band. However, instead of common sense prevailing, it was decided to call the album The Giggle-Eyed Goo! It seemed that what had originally been a novelty song for a B-Side was going to haunt the band. Worse was to come though. After Steve and The Board completed The Giggle-Eyed Goo!, drummer Colin Petersen announced that he was leaving the band. This was a huge blow for the band, as Colin Petersen had been a member from day one and was a talented drummer. Replacing him wasn’t going to be easy. The loss of Colin Petersen couldn’t have come at a worse time, with Steve and The Board about to release their debut album The Giggle-Eyed Goo! It features on the first twelve tracks on The Complete Steve and The Board, and is a reminder of a talented and versatile band. Opening The Giggle-Eyed Goo! is the title-track, and ironically given its novelty nature, is the song that is synonymous with Steve and The Board. Songs like I’m To Blame, I’ve Just Realised and Rosemarie are reminiscent of The Beatles pre-1966 and British Invasion groups like The Hollies. Rosalyn is a sneering slice of R&B, where Steve and The Board draw inspiration from the Rolling Stones. Margot has a much more rocky, stomping sound, but is still melodic and brings to mind The Who. I Want is hook-laden, R&B stomper where Steve and The Board sound like the Rolling Stones, while the hook sounds as if it has been inspired by It’s All Over Now. Another hook-laden R&B stomper is I Call My Woman Hinges (Cause She’s Something To Adore). In a similar vane is Little Miss Rhythm And Blues. Farmer John is one of the rockiest tracks on the album. It’s built round a blistering guitar riff and mesmeric drums, while Steve unleashes one of his best vocals. Love’s Made A Fool Of You is a cover of song penned by Buddy Holly, and sounds as if it’s been inspired by Bo Diddley. The album closer, Lonely Winter, sounds like an homage to Carole King’s It Might As Well Rain Until September. By the time Steve and The Board’s debut album The Giggle-Eyed Goo! was released, the band had a new drummer, Geoff Bridgeford. He gave up a job with an advertising agency to join Steve and The Board. This was a decision he might later rue. Once Geoff Bridgeford settled into the role of Steve and The Board’s drummer, the band continued their gruelling touring schedule. This found Steve and The Board crisscrossing Australia, as they played in towns and cities. Some nights, the band played four, even five gigs. This was a relentless schedule, and one the band continued day after day, week after week. Somehow, Steve and The Board found some time to record some new songs. Steve and The Board went into the studio and recorded So Why Pretend, Now I’m Older and Sally Was A Good Old Girl. After recording the new songs, it was back to the live circuit. Despite the constant touring, Steve and The Board managed to squeeze in a couple of appearances on television. Somehow the members of Steve and The Board were managing to cope with a schedule that even older, more experienced bands would’ve struggled with. By then, Steve and The Board’s popularity was at all-time high. They were mobbed after gigs, and literally, had run to their cars. Sometimes, they were accosted by jealous boyfriends. It got to the stage that Steve and The Board had a police officer living with the group, who were experiencing Beatlemania. The members of Steve and The Board should be wealthy young men. As Steve and The Board returned to Sydney, the group realised that their finances needed some attention. New recruit Geoff Bridgeford was given the job of looking their finances. For a group who had literally lived on the road, playing four and five gigs each night, Geoff Bridgeford worked out that all Steve and The Board were owed was just $600. This must have come as a huge blow. To make matters worse, collecting what they were owed was easier said than done. 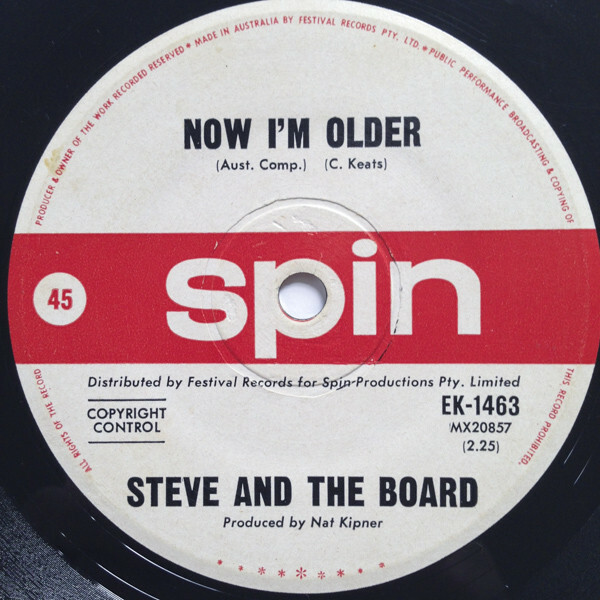 During September 1966, Steve and The Board released their next single, Now I’m Older which featured So Why Pretend on the B-Side. Later that month, Steve and The Board were one of the bands booked to support PJ Proby at Melbourne’s Festival Hall. On the ‘30th’ September 1966, Steve and The Board took to the stage at the Festival Hall. For a group that had played hundreds of gigs, this was the one that went wrong. They weren’t alone though. It was a disastrous gig for everyone involved, with technical problems sabotaging Steve and The Board’s performance. Despite this, the press turned on Steve and The Board. Just like many other bands, the press had built them up to knock them down. Steve and The Board headed out on another tour, which was billed as The Steve and The Board Spectacular. It began on the ‘5th’ October 1966, and concluded six days later on the ‘11th’ October. Despite its brevity, it had been another gruelling tour. There was no rest for the band though. They had to film a promotion film for their next single, which was the Alex Hill composition Good For Nothing Sue. It’s one of the four bonus tracks on The Complete Steve and The Board. So is the B-Side Sally Was A Good Old Girl. After the film was complete, Steve and The Board headed out on the first of two tours. Then on ‘1st’ December 1966 featured on the Go!! television show for what would be the last time. 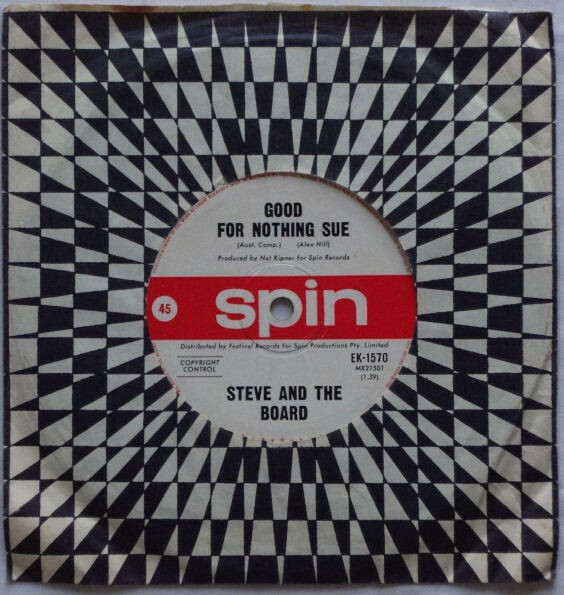 In January 1967 Good For Nothing Sue was released by Spin. By then, music was starting to change, and the psychedelic era was in full swing. Steve and The Board was just one of many bands who suddenly were no longer as popular. By the spring of 1967, gigs were starting to dry up for Steve and The Board. They were only playing two, maybe three nights a week. 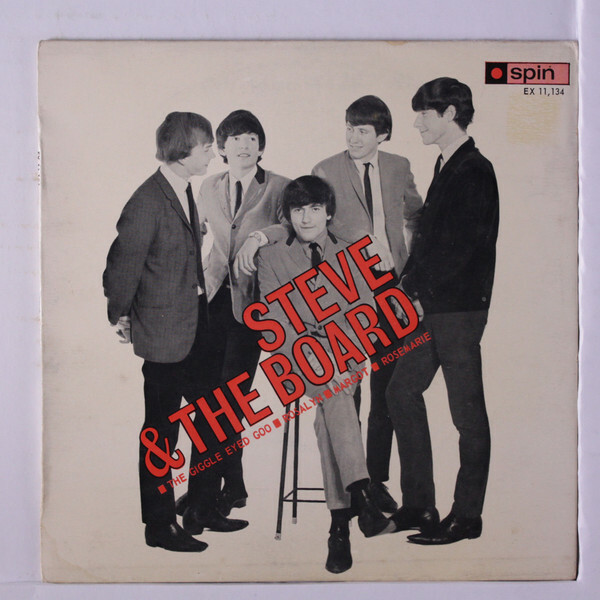 Steve and The Board continued for a couple of months, and on ‘17th’ May 1967 the band split up. After two years, the dream was over. Despite all their hard work, and the gruelling tours, Steve and The Board didn’t end up rich men. Just like many other groups before them, much of the money ended up in other people’s pockets. Sadly, that still happens today. For Steve and The Board, there was no gold at the end of the rainbow. Later, Colin Petersen enjoyed a brief spell as the Bee Gees’ drummer. Later Colin Petersen joined the band Humpy Bong who released the single Don’t You Be Too Long in 1970. However, another former member of Steve and The Board went on to enjoy fame and fortune. After a brief solo career, Steve Kipner became an award-winning songwriter and producer. He penned songs for everyone from America, Diana Ross, George Benson and Olivia Newton John, to Heart, Joe Cocker, Neil Diamond and Rod Stewart. The songs that Steve Kipner have written have solid by the million, and he has a string of gold and platinum discs to his name. Steve Kipner has also won the prestige Ivor Novello Award. For Steve Kipner, there was life after Steve and The Board, who are still remembered some city years after they split-up. Although they were only together for two years, they were a whirlwind for the members of Steve and The Board. During that period, they toured relentlessly and recorded only sixteen songs. They feature on The Complete Steve and The Board, which will be released by Playback Records on ‘21st’ July 2017. It’s an opportunity to discover one of Australia’s greatest garage bands. Sadly, outside of Australia, Steve and The Board are largely unknown. That is a great shame, given they were a talented and versatile band. Within Australia, Steve and The Board are remembered by many people, who remember that two-year period when they enjoyed their own version of Beatlemania. 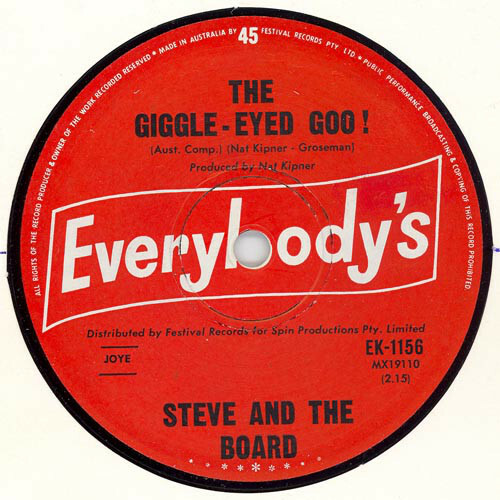 Ironically, many people remember Steve and The Board for their first hit single The Giggle-Eyed Goo! However, the followup single I Call My Woman Hinges (Cause She’s Something To Adore) is much more representative of Steve and The Board’s music which is documented on The Complete Steve and The Board. It’s a lovingly curated compilation that is the most comprehensive overview of Steve and The Board’s two year career. ← CHARLEY PRIDE-YOU’RE MY JAMAICA, ROLL ON MISSISSIPPI, EVERYBODY’S CHOICE AND CHARLY PRIDE LIVE.